Emmanuel Macron, 39, has been inaugurated as France’s president and pledged to overcome division in societies. 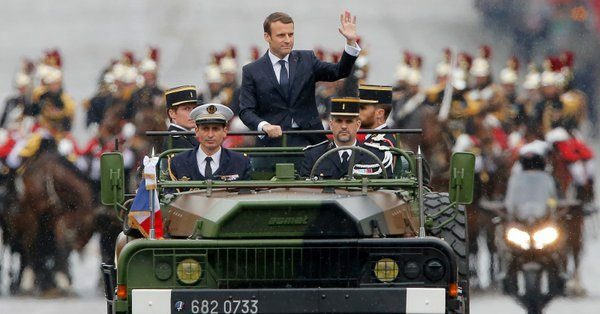 Macron, a centrist, took over on Sunday from President Francois Hollande, the socialist whose five years in power were plagued by stubborn unemployment and attacks. Macron – France’s youngest ever president – beat his far-right rival Marine Le Pen to the presidency, winning more than 65 per cent of the May 7 vote. “The whole world has watched our presidential election,” Macron said in his inaugural speech as president, which took place at the Elysee Presidential Palace. want a France that is sure of its destiny. He said France was not in decline, but at the start of an “extraordinary renaissance”, adding that he would boost employment, protect companies and engage with French people who feel ignored. Francois Hollande is delighted at the election of the former investment banker. Hollande launched Macron’s political career, and brought him from the world of investment banking to be an advisor and then his economic minister. “I am not handing over power to a political opponent, it’s far simpler,” Hollande said. Meanwhile, Macron is expected to reveal the closely-guarded name of his prime minister on Monday before flying to Berlin to meet German Chancellor, Angela Merkel. It is virtually a rite of passage for French leaders to make their first European trip to meet the leader of the other half of the so-called “motor” of the EU. Pro-EU Macron wants to push for closer cooperation to help the bloc overcome the imminent departure of Britain, another of its most powerful members.